Today I am working with a lantern in my dining room. Okay remember my best budget decorating tip where I talked about the value of buying things you love that are timeless and good quality? It may not save money the day you buy it, but it will save money over time, because you won’t want to or need to replace these items. This lantern is one of the things I am talking about. Here’s what I love about it. It’s super heavy and well made. When you pick it up, you’ll realize it’s not a cheap lantern. The finish on the lantern is a matter finish that I love. Now let’s get down to business. Here is why buying something nice like this lantern will save you money. This one is well made and heavy duty. It’s a classic design that will be in style for years and years, and years. So it will be in style for the long haul, and it’s well made. But here’s the best part. This lantern would work just as well in the fall, winter and spring as it does in the summer. You can add fall leaves in the autumn, evergreen branches in the winter, flowers in the spring, and so on, and so on. You could use candles of different colors also, and a ribbon on the lantern. The flowers are Plumbago I cut from the back yard. Lanterns are a great investment and can be used wonderfully with seasonal decor. Love that lantern, Anita…it’s gorgeous! I love lanterns too.They are very versatile. I love yours, the gray metal looks great in your setting! 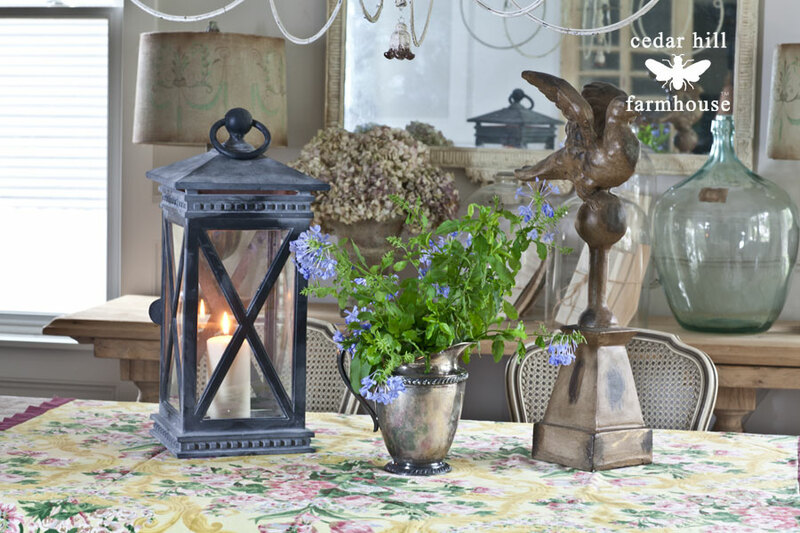 Love the lantern and they way you used in this beautiful summer setting! I agree, Anita. The medium lantern is great quality – I love your tips on buying high quality items that will serve well for years to come! 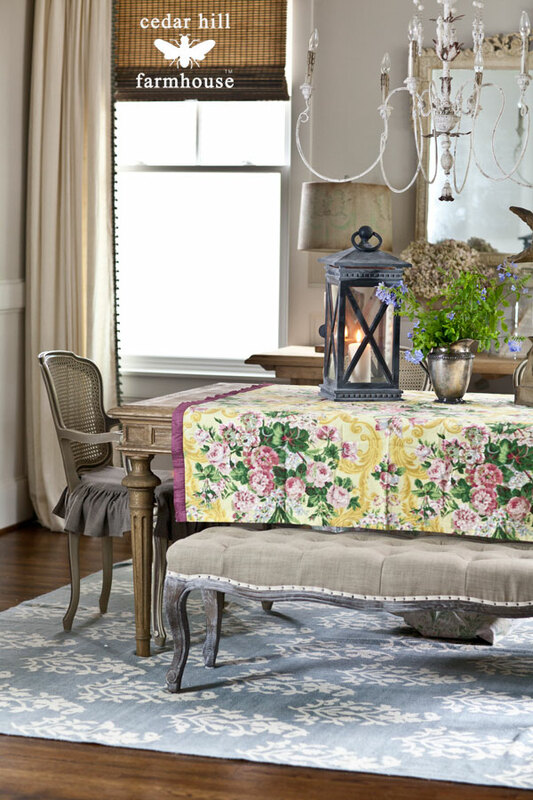 And your dining room is gorgeous! ANITA QUE BELLEZA DE MANTEL FLOREADO Y LA LINTERNA PRECIOSA,FELIZ VERANO A USTEDES,ABRAZOS. I love your styling and taste Anita. Beautiful and stunning every time. 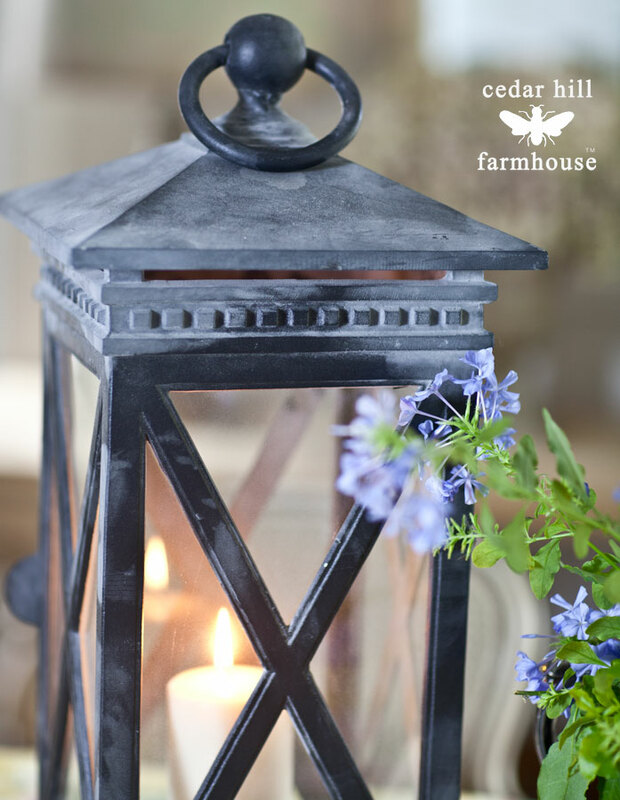 What a perfect lantern, especially with your lovely florals. Thanks for sharing today. Love this lantern, perfect for year round use! LOVE that lantern! As always, your styling and tips are so inspiring! Everything looks so beautiful! pretty pretty, as usual. I saw that lantern but decided to get the wineglasses instead. Cheers! Their lanterns are gorgeous! I have a similar one that I use all year long. Goes from summer to fall to Christmas. I even put a birds nest in it fro spring 🙂 BTW, I love that bench in the dining room!!! 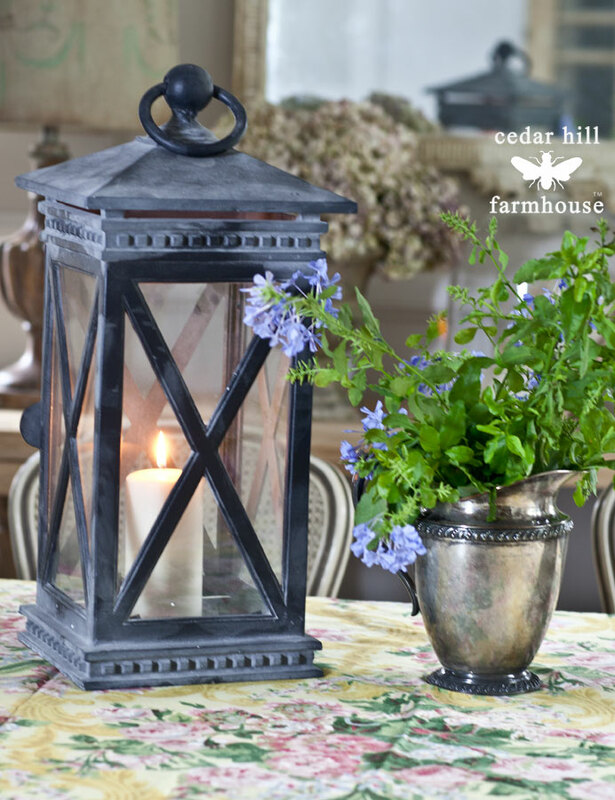 Your Balsam Hill lantern is the perfect touch for your beautiful tablescape! I love how your lantern can be used outdoors or inside as well. Perfect for anytime of the year! Just lovely Annita! I’m in love with your dining room chandelier…that is quite impressive. Enjoy your week. Thank you Amy; it’s my favorite. I love the lantern and how you styled it! Good quality decor is just like good quality clothing – it lasts forever and never goes out of style. Thanks so much for sharing, Anita! Your lantern looks beautiful, Anita, and you styled it perfectly ~ as usual! That lantern does indeed look heavy and quite sturdy. I know that you are going to enjoy decorating with it from season to season. It looks so pretty on your table. I have am obsession with lanterns! We are on the same page! I put my decorating dollars towards good quality items with timeless style and use them year after year! I love the lantern you picked and your vignette – so pretty! The lantern is really nice. l would like to get some for the patio., thanks for info on the one your showing. Anita, the lantern is lovely on your dining table with the silver creamer/pitcher with the flowers! I pick up old lanterns at garage sales, I usually paint them white and then distress them. Sometimes I take a vintage black and white photo, (did one recently with Ginger Rogers and Fred Astaire) cut it to fit inside one glass pain and it looks so great. Can also conceal a glass pain that may be broken. Thanks for all the good suggestions on what to place inside lanterns. I don’t have any in my home but I think they are so attractive. My Mom and I LOVE lanterns and we have oodles…in different colors and styles. I use them in and outdoors when decorating. QVC sells ” Luminara” flickering candles, as well as lanterns that come complete WITH the Luminara candle. AND… as if that isn’t good enough, they also have lanterns with the “Luminara” candles that can be placed outdoors in the elements!!! For those of you who may not know, “Luminara” is the design name behind the wonderful lighting effects in some of the most popular rides, etc., in Disneyworld and Disneyland! P. S. – I love the lantern you are showing here. Where did you find it?